Get ready for some great racing action with the triSeries Standard, Spring and Super Sprint distances. Standard Triathlon: There has been a massive increased demand for the Standard Triathlon. With the increasing exposure through the ITU race series and a generally growing base of athletes we have seen races sell out in hours. Swim 1.5km The swim leg will be held at the southern end of One Mile Beach. Whilst this is an ocean swim, the seas are usually calm with only a small swell/wave breaking near the shoreline. The course will be set on the day, according to the conditions. Bike 40km The bike course will be a three lap ride along Gan Gan Rd and Frost Road. The course is best described as flat to undulating with a bit of a climb towards the northern turnaround point on Gan Gan Road. The climb will give competitors the option of getting up out of the saddle to stretch their legs but will not require any special gearing. 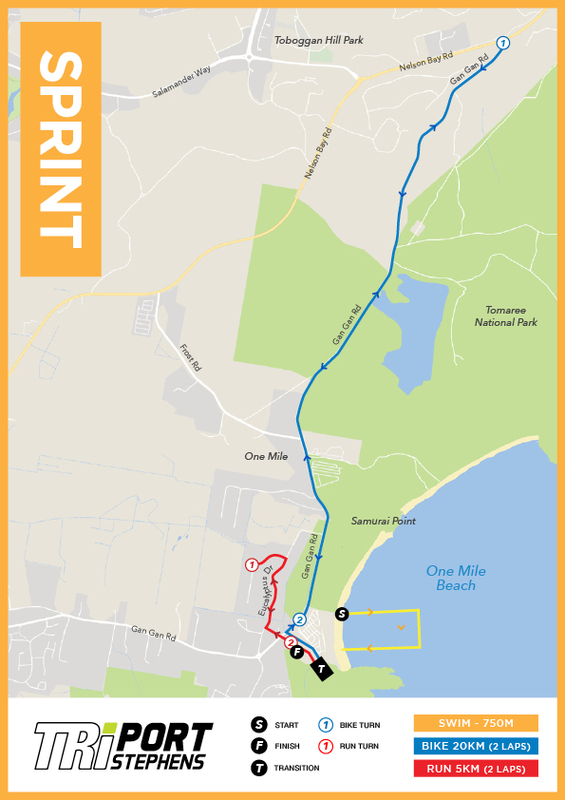 Run 10km The run course will be a flat three lap run along the paths/footpaths of Gan Gan Road, Koala Place, Eucalyptus Drive, Melaleuca Drive, and Casuarina Close. Sprint: Feel the need for speed, maybe a step up from the Super Sprint or a hit out for something bigger around the corner? Sprint racing has plenty of action and excitement as you swim, bike and run yourself around some of Australia’s most stunning locations. Swim 750m The swim leg will be held at the southern end of One Mile Beach. Whilst this is an ocean swim, the seas are usually calm with only a small swell/wave breaking near the shoreline. Bike 20km The bike course will be a two lap ride along Gan Gan Road. The course is best described as flat to undulating with a bit of a climb towards the northern turnaround point on Gan Gan Road. The climb will give competitors the option of getting up out of the saddle to stretch their legs but will not require any special gearing. Run 5km The run course will be a flat two lap run along the paths/footpaths of Gan Gan Road, Koala Place and Eucalyptus Drive. 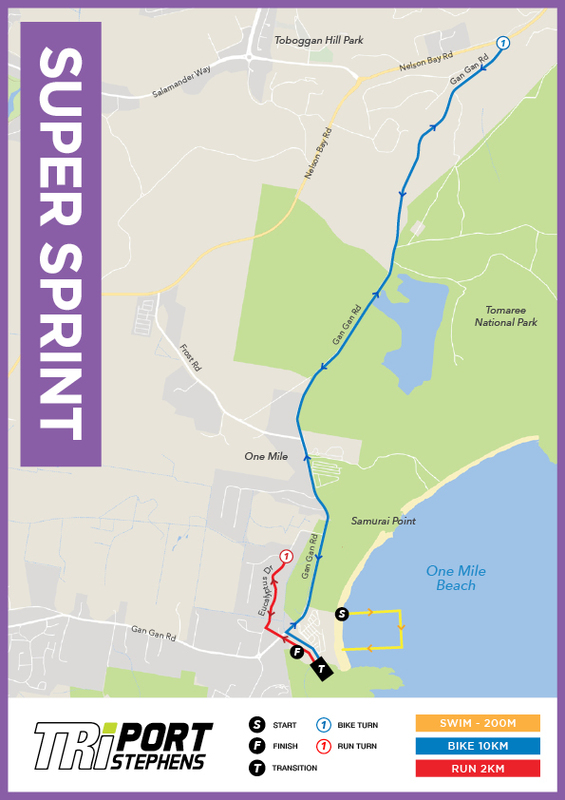 Super Sprint - The Super Sprint distance is fast becoming one of our most popular distances to race. This is the “can do” triathlon. Race in a supportive atmosphere amongst other like minded people and become part of the thrill and excitement of triathlon racing whilst gaining the absolute joy and pride that comes with accomplishing a personal goal. Flippers will be permitted for this event, but medals will not be awarded to these entrants. Swim 200m The swim leg will be held at the southern end of One Mile Beach. Whilst this is an ocean swim, the seas are usually calm with only a small swell/wave breaking near the shoreline. Bike 10km The bike course will be a ride along Gan Gan Road. The course is best described as flat to undulating with a bit of a climb towards the northern turnaround point on Gan Gan Road. Run 2km The run course will be a flat one lap run along the paths/footpaths of Gan Gan Road, Koala Place and Eucalyptus Drive. Collection of your Registration pack is COMPULSORY for all individuals Entrants and ONLY ONE representative from a team. It is approximately 2½ hours drive north of Sydney along the M1 Motorway. At the end of the M1, turn right at the roundabout, following the sign ‘Hexham & Pacific Highway’ (BP service station and Hungry Jacks will be on your next left).The road will veer to the right and merge with the New England Highway after which you should merge to the left lane taking the sign ‘Taree & Pacific Highway’, which will direct you over the Hexham Bridge. Look for the sign ‘Next Exit Richardson Road – Raymond Terrace/Nelson Bay’ to get to Lemon Tree Passage, Soldiers Point, Nelson Bay, Corlette, Shoal Bay, Fingal Bay, One Mile Beach or Anna Bay.Once on Nelson Bay Road, continue until right turn onto Gan Gan Road heading towards Anna Bay. Pass the town of Anna Bay and continue along Gan Gan Rd until you reach Hannah Parade on your right. 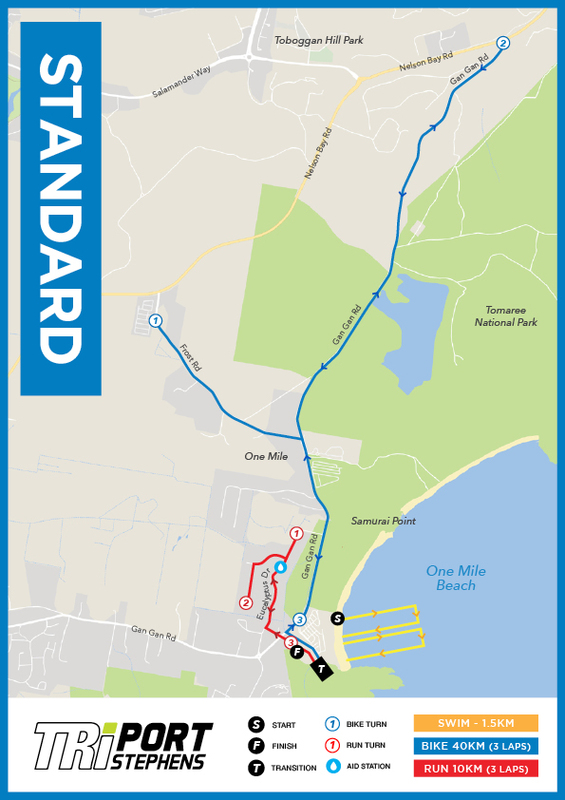 Race HQ is at the end of Hannah Parade, One Mile in the One Mile Beach car park. Business will be as usual in Port Stephens on the date mentioned above, this notice is merely to inform businesses, residents & visitors of altered travel routes & how to commute during the events. There will be periods during the triathlons when there will be no cyclists on Gan Gan Rd & Frost Rd. During these periods, residents and visitors requiring access to parks and villages will, under the direction of traffic controllers, be allowed to travel along these roads. How can I access the race results? Results can be accessed via the Results link at the top of the page. When will results be uploaded? Results will be uploaded as soon as possible after the completion of the event. How was Port Stephen triathlon Festival?